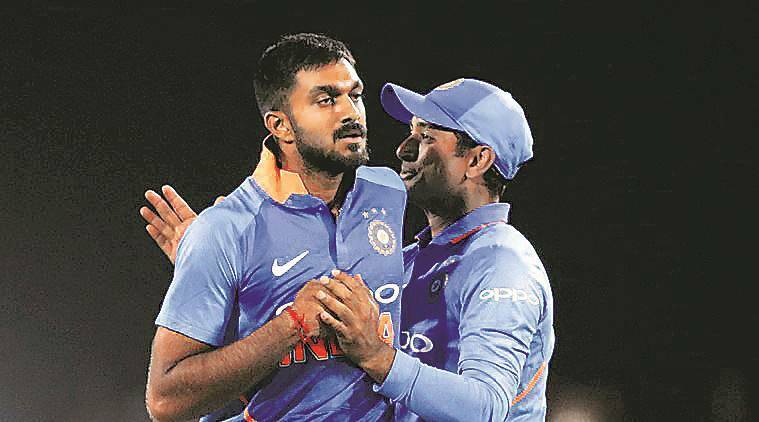 One evening several years ago, when Vijay Shankar reached home after a first-division match, wherein he had bagged a duck, his grandmother asked him: “Ennada, enneku seria viladleya? Paravala nalai marunal match irikku, nalla paneedungo (Didn’t you make runs today? Don’t worry, there’s a match day after tomorrow!). Vijay was amused how she had memorised the dates. But then his entire family knew, without sticking the schedule on the wall, when and where he was going to play. The family’s cricket obsession had him worried at times, especially before he broke into the state team. “They’ve never made me feel any sort of pressure, but I knew they had made a lot of sacrifices for me, encouraged me like few parents would, and so I have to repay them,” he once said in an interview. Sacrifices like converting their house terrace into a functional nets, affording him the licence to pursue cricket and not fret over his academics, the countless days his father H Shankar had bunked office to carry his son to different parts of the state for age-group cricket, and his elder brother Ajay waking up with aching shoulders after long evenings of bowling, everything from medium pace to leg-spin. Even the neighbours, Shankar interjects, who tolerated the pounding of wood on leather throughout the day. “I’m someone who became a cricketer not purely because of my abilities, but because of the efforts, love and prayers of my family and friends,” he’d said. It’s typical Vijay, unassuming and understated, almost to the extent of sounding inhibited. It impressed as much as it dismayed former Tamil Nadu coach WV Raman. “He was so open-minded to advice that I feared he would clutter his mind with too much advice from too many different people. But later I realised that he was sharp enough to filter the ideas, to pick only what suits him. He had a clear mind regarding what he wanted to achieve,” he says. One of them was converting himself from an off-spinner to a medium pacer when he was around 20. It was his personal coach S Balaji, ironically the same person who had taught him off-spin, who nudged him in that direction. Vijay asked him whether it was too late for the switch, which the coach answered with the familiar story of Ravi Ashwin, an opening batsman who remoulded himself into an off-spinner. As impressionable a youngster as Vijay was, it didn’t take much persuasion. At the back of his mind, the coach also knew the seam-bowling-all-rounder stock in the state was so thin that Vijay stood a better chance of catching the selectors’ eye than with off-breaks. “He had a seamer’s frame and the natural aggression. So it was just about getting him comfortable with the action, grip and other technicalities,” he says. That he’s a quick learner has evidenced resoundingly in his brief career. From a nervous rookie in his first tournament – let him not be reminded of the Nidahas Trophy final nightmare – he has evolved into a buoyant cricketer fully aware of his skills. Thrust into unfavourable circumstance in New Zealand, Vijay demonstrated his self-belief, none so telling as the 45 off 64 balls in a rescue act in Wellington. “The biggest lesson I learned from the Nidahas final was that there’s no point worrying over your past mistakes, but make the best of your next opportunity. I was deflated, but when I look back I feel the experience has only made me tougher,” he’s said. In the span between the teary Colombo night and his resurgence in the limited-overs series in New Zealand, Vijay substantially improved his batting with Rahul Dravid during the A tour to Kiwiland. The emphasis was on his defensive technique. Previously, he was vulnerable to the incoming delivery, as he used to leave a considerable gap between bat and body, aggravated by his tendency to reach our for the ball from his crease. So Dravid asked Vijay to take a longer stride. Once the glitch was ironed out, he became a more fluent driver of the cricket ball. Even after the tour, he practised the tweaked stride on the terrace nets (500 balls a day!). While all the focus has been on his batting in the last few months, the 28-year-old has shortened his run-up so that he could be quicker, a facet of the game where he’s shaded by Hardik Pandya. The results, yet again, were evident against Australia, as he consistently touched the 135kmph mark. He also bowled a terrific last over in Nagpur, accounting for a brace of wickets, withering Australia’s 11-run pursuit. It could have been cathartic, in exorcising the Nidahas demons. “To be honest, I was literally waiting for the opportunity. After the 43rd over, I was telling myself I’m going to bowl the last over and going to defend it,” he said. These confident words best capture his coming of age and career-upswing. And he’s no longer worried about his cricket-obsessed family, even if they would have already memorised the World Cup schedule.